A corporate symbol that contributes to the image of your company. A mark of quality and excellence that identifies your company as the owner. These trademark wall displays can be installed individually or together to showcase your corporate trademark portfolios. Text/Images are laser-engraved on a solid black brass or black aluminum plate. Available in three popular layouts and can be customized to your specifications. Logo and images can also be included at no additional cost. Mounting hardware include caps, stand-offs, drywall anchors, and installation instructions. Available in three premium metal finishes: Chrome, Gold, and Satin Silver. This Trademark Plaque - TransLucite® CL2-TM15BS is part of our Mission Statement and Trademark Series of products, check out other products & options available in the Mission Statement and Trademark Series of our selection. 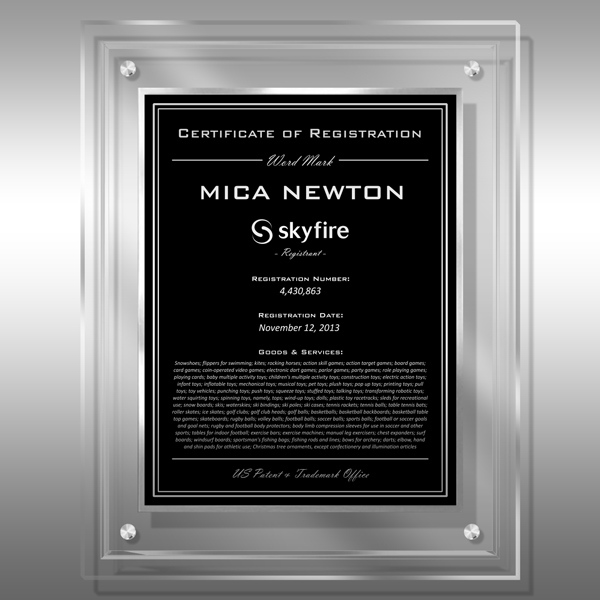 This Trademark Plaque - TransLucite® CL2-TM15BS can be modified to your requirements and is available for your corporate award programs.